Endometriosis (pronounced: en-doe-me-tree-O-sis) is a cancer-like condition (based on it's stages) that causes a woman's reproductive system to attack itself. Cherrelle (Coleman) Lawrence has suffered from painful cycles, since the age of 15. For years, doctors could never pin-point the problem. Many doctors convinced her that it was "...just a heavy cycle..." or "...all in your mind..." However, when the pain began to take over her life, she knew there had to be more to the story than what doctors were leading her to believe. In 2010, after receiving her Bachelor's degree, Cherrelle decided to pursue her life-long dream of becoming a teacher. Soon the pain began to interfere with her work-life as well: missing instructional days, going to work in pain, even passing out in her own classroom. This became the norm for Cherrelle. It didn't take long for her to truly realize "...something is seriously wrong!" She decided to seek medical professionals, again, and finally found someone who was willing to perform a surgery; however, it wasn't for the right thing. Over the course of 3 years, Cherrelle went through numerous procedures: Removal of polyps, Cryosurgery (freezing of the uterus), D&C (scraping of the uterus), Colonoscopy, and many other painful procedures. Still, there was no answer. In January 2012, she was diagnosed with Deep Vein Thrombosis (DVT) - a condition that causes blood clots to form in the major arteries of the body. This led medical professionals at a local hospital, to refer her to Duke University Hospital. In April of 2012, 2 days after her husband's engagement proposal, Cherrelle underwent laproscopic surgery including the excision of all visible Endometriosis. Post-surgery, the gynecologist informed Cherrelle and her family that she had a severe case of Endometriosis (Stage IV); one of the worst he had seen in years. The Endometriosis caused damage to her reproductive system. By the fall of 2013, the Endometriosis had grown back. Cherrelle continued to visit various doctors, including experts at Johns Hopkins in Baltimore, MD. Due to her inability to be present in the classroom, she decided to resign from teaching in the classroom; her Stage IV Endometriosis played a major part in this decision. She was unable to walk without assistance, pain became an "everyday thing," and it slowly began to take over her quality of life. 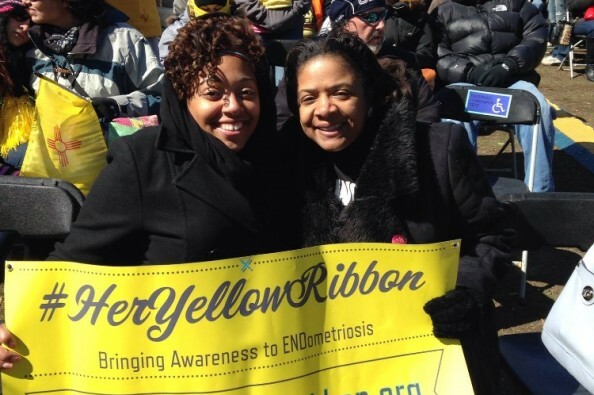 During this time, Cherrelle decided to start an awareness group to spread the word about Endometriosis to women throughout the U.S. She was even recognized by several National Endometriosis Awareness groups as a nominee for "Endo Hero of the Year" for her work in the community. As you can see, this condition has taken a toll on her life, physically and socially; but Cherrelle continues to remain strong and steadfast in her journey to find relief! She is now seeking assistance with funding her medical venture to find relief from Endometriosis. We are now 1 month post-surgery and I am recovering very successfully! I would like to inform you all that we managed to raise $2,270, which must have been in God's plan, because my hospital expenses, medical expenses & surgery were covered COMPLETELY with not 1 cent owed! You all are amazing! I am SO GRATEFUL for your contributions. Martin and I are blessed to call you all family and friends. At my post-operative appointment, the doctor said that my body was healing faster than she originally planned for it to, which is something to SHOUT about! They were able to remove ALL of the ENDometriosis and restructure my reproductive system to tame and get rid of my PCOS (Polycystic Ovarian Syndrome). Thank you to EVERYONE who prayed, donated, sent a text, flowers, email and even just thought about us! It WORKED! I am living (stronger than ever) to tell my testimony to the WORLD! You all are such a huge blessing and I am ever so thankful for you! Thank you all for your donations, love and support. Surgery went well. They were able to get everything. Had a few complications, causing me to lose my voice, so please pray for that healing as well. 3 days away from our departure to VA for surgery. I am nervous, but certainly hopeful. I thank you all for your contributions to making this possible! We are just $80 from $2,000 and I have nothing but hope that we will surpass that. Please continue to keep us in your thoughts and prayers. We will try to post/share progress post-surgery. We thank those of you who have already committed your time to helping me post surgery and helping Martin with meals and care. If you are interested in helping, please call/text or email me: Cherrelle.Coleman@gmail.com & 3017588707. As of today we have raised $1,900!! We are now $38% closer to our goal of $5,000! As stated before, we will keep the donation line open for anyone who would like to contribute. Please continue to share and support! I admire your strength, Cherrelle. You are in my thoughts and prayers. I pray that your surgery this week is successful, and that it brings you peace and comfort! Cherrelle, Continue to trust in God and allow him bless you. You are strong through Christ who strengthens you. Praying for you lady! Hope this helps! I'm really praying for you! Stay strong! You can do this! I love you! Good luck sis...will continue to keep you in my prayers. Love you! On Behalf of Bishop Alston & Perfecting Praise Ministries! We're praying for you and we're here for you! We love you both! Love you Cherrelle! Stay strong! Hello my dear Cherrelle & Martin, Here is a donation from Daddy and I for your hotel stay and a little extra for your travel to Virginia. We love you and we are always praying with you. Here is a donation towards your surgery. We love you!